Let’s take a little trip to the Spanish Countryside. Imagine yourself sipping some sangria (or freshly squeezed Valencia oranges) and looking out over dusty mountains. Sun soaking into your skin, and a delicious spread of food set out before you. I might not have plans to visit Spain in the near future, but I sure can enjoy some of those Spanish flavors. 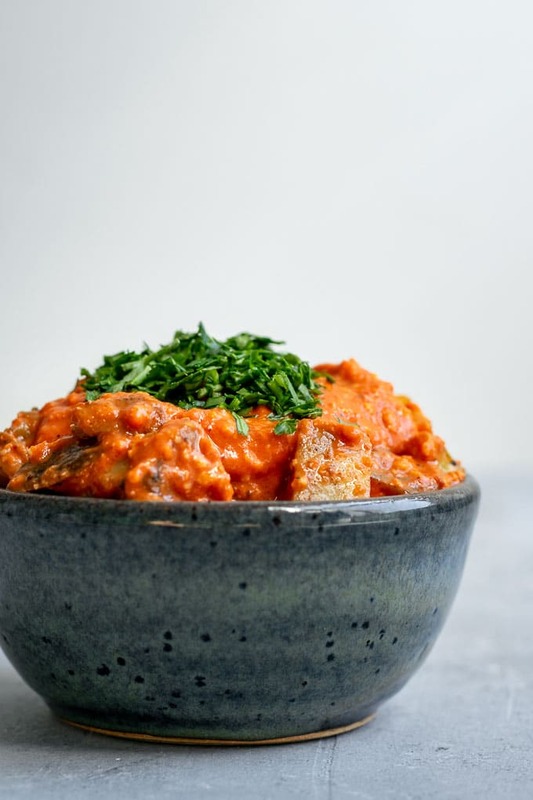 And it doesn’t get much better than a mouth watering romesco. 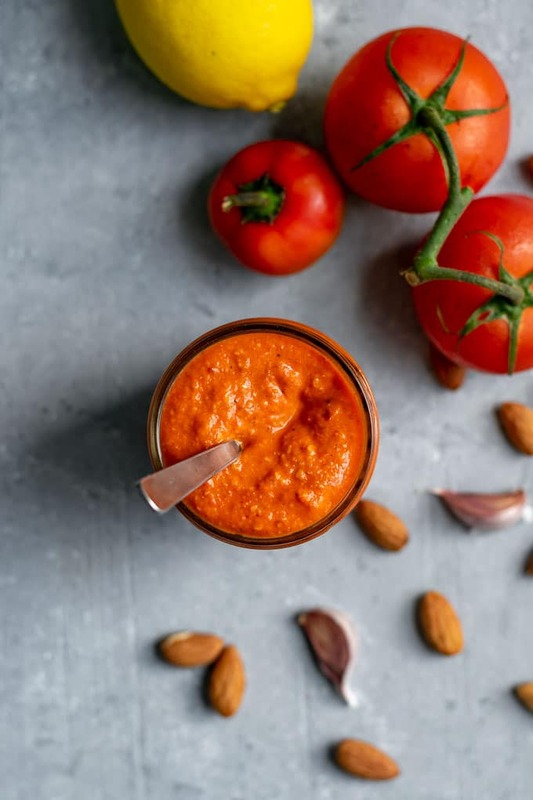 Romesco is a sauce made with nuts and peppers. There are so many different versions and recipes, but my favorites always include smokey, roasted ingredients. It originated in Catalonia, so if you’re ever in Barcelona definitely seek it out! In Catalan cuisine, it often tops fish (boo for us veg-heads, though at home you can definitely substitute grilled tofu) and vegetables (woo!). 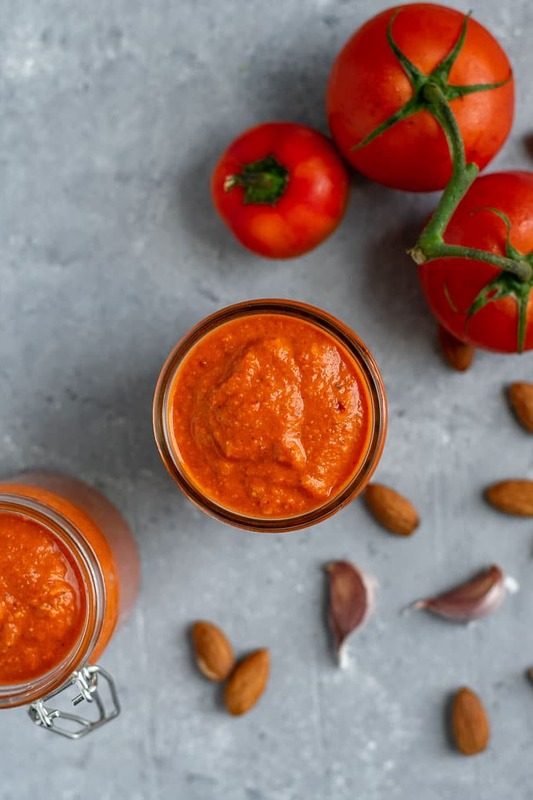 Beyond using romesco as a sauce, it also makes a great dip and a delicious spread. 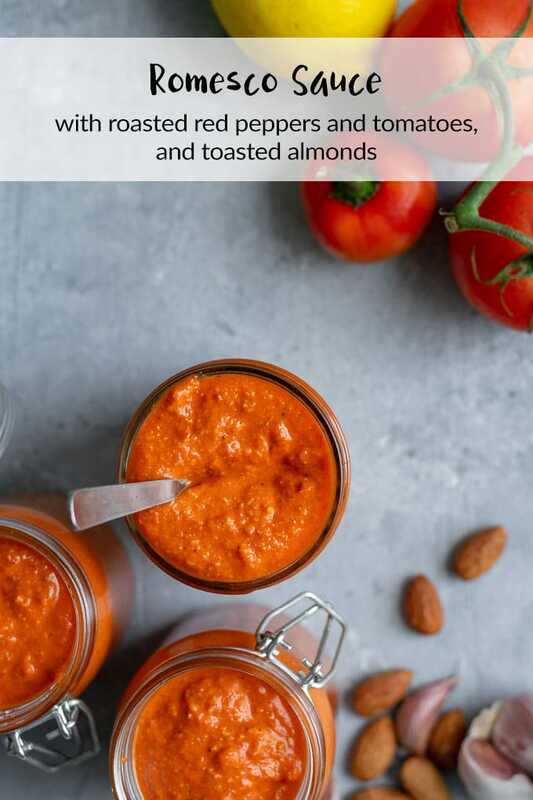 This easy romesco sauce is made by roasting almonds, peppers (both sweet and spicy), tomatoes, and garlic. Roasting deepens the flavors, sweetens the fruit, and makes the whole sauce sing. Traditionally romesco is made with local varieties of peppers which I don’t have access to. But sweet red bell peppers and a medium spicy chile pepper (or 3) combine to make a well flavored sauce with a nice little kick. I found some lovely red cherry bomb peppers at my local store this time around and went ahead and used those in the recipe. They actually ended up being quite spicy, but we love that chez Chickpea! You want to choose a red or yellow hot chile, as green will muddle the color of the final sauce. If you can’t find fresh red chile peppers, substitute crushed red pepper for some heat, or use rehydrated dried chile peppers. Dried Spanish or Catalan peppers would be great, but in the US it’s easier to find dried American chiles–ancho, New Mexican chiles, chiles de arbol, & pasilla would all taste great in this sauce. For the bell peppers, I like to just pick up a jar of pre-roasted peppers, it makes this sauce quicker and simpler to make. But since you’re already roasting things, you can go ahead and roast red bell peppers if you’d like, they’ll just take longer to prepare that way. Tomatoes and garlic cloves are roasted along with the chile peppers until nice and juicy. Tomatoes sweeten the sauce and add a little needed acidity, while roasting the garlic mellows their bite and adds a little more smokiness to the sauce. I also like to toast the almonds. Toasted nuts are a lot more fragrant and flavorful than raw nuts, and our oven is already on so it’s super easy to do! If you’re not into almonds you can substitute walnuts, pine nuts, hazelnuts, or another nut that strikes your fancy. Changing the nut will of course change the flavor of the sauce, but variety is the spice of life (or something like that, right?). Once everything is roasted and toasty, you just dump it all into the food processor or blender along with the rest of the seasonings and process until smooth-ish. I find I like romesco best when there is a bit of texture from the nuts. In a food processor, and non-high powered blenders, it’s hard to over do it but something to keep an eye on as you blend. For the rest of the spices we have: a freshly squeezed lemon and its zest, a splash each of olive oil and sherry vinegar, a generous scoop of smoked sweet paprika, and salt to taste. This sauce is so easy to make and a great way to enjoy your veggies–especially potatoes. 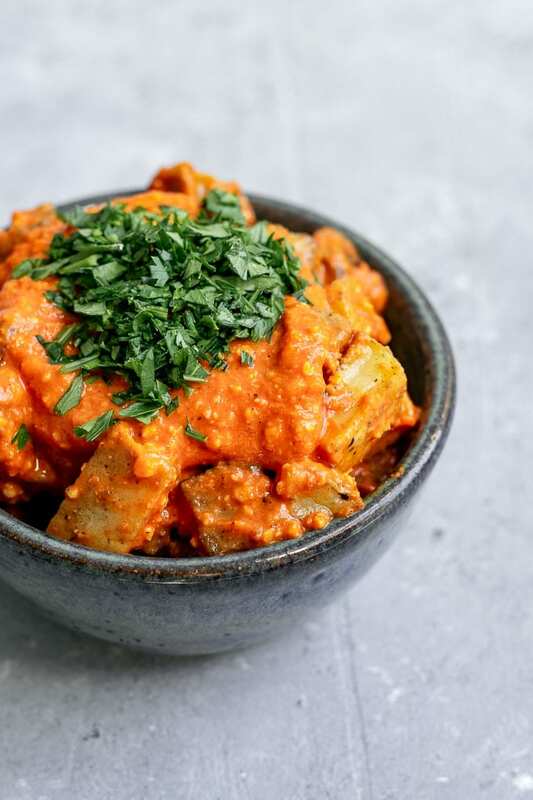 I’ve enjoyed a similar sauce on mustard roasted cauliflower and think this romesco would be even better! It would be a great spread for a sandwich or grilled cheese/panini. Use it as a base on your next pizza! The possibilities are nearly endless. 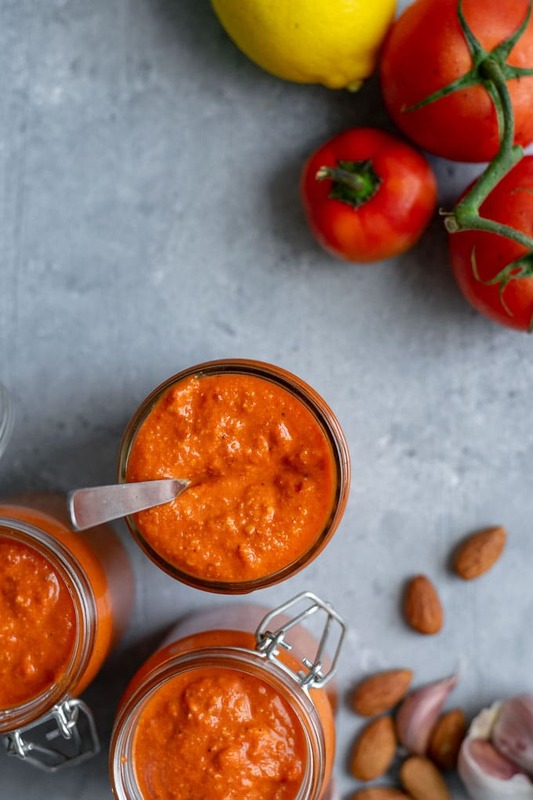 If you make this easy romesco sauce, let me know how you liked it and how you used it! Leave a comment and rate the recipe below! And tag your recreations @thecuriouschickpea and #thecuriouschickpea on Instagram, I absolutely love seeing your photos! You can substitute the hot chile peppers with medium to low spicy dried peppers (new mexican chiles, ancho, arbol, etc). To prepare, rehydrate the peppers, then remove stem and seeds–don’t roast them. Or add the crushed red pepper instead. 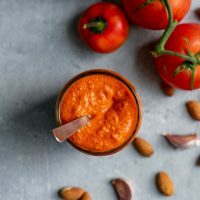 This easy romesco sauce is made with toasted almonds and roasted tomatoes, chiles, and red bell peppers. The ultra flavorful sauce is also great for dipping and makes a delicious as a spread! Spread the almonds, garlic, tomatoes, and chile peppers (if using) on a baking tray. Bake for 10 minutes, or until the almonds are toasty, then remove the almonds. Turn the oven to broil and set the rack about 6-8" from the top of the oven. Broil about 10 minutes until the garlic skins start to char, the tomatoes are juicy and their skin is splitting, and the chiles are starting to blister. When cool enough to handle, remove the peel from the garlic and if you would like, de-seed the chiles and remove the blistered skin (optional). Add all of the ingredients into a food processor. Process until you reach the desired consistency, the sauce should be relatively smooth with some texture from the nuts. So good! I roasted the red peppers instead of using jarred because that’s what I had on hand. Very tasty sauce!